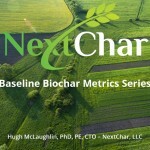 Amherst, MA: NextChar LLC, based out of Amherst, MA has formed a partnership with Boston-based City Soil to create a superior compost blend for farmers, gardeners, and landscapers. City Soil is adding NextChar’s high-quality, porous biochar to their compost. It is a perfect marriage; the compost provides nutrients to the soil, while the biochar helps hold those nutrients, as well as moisture, in the soil for the plant roots to access. Biochar is a nearly pure carbon, all-natural, and naturally-occurring material that is produced by heating biomass just above its kindling temperature in an oxygen reduced environment, producing a stable, low ash content, and extremely porous compound with numerous high-value applications. Biochar works like a sponge: it absorbs and holds nutrients and moisture in the soil, preventing it from runoff and evaporation, and the plant roots can continue to access it throughout the season. Studies have shown that incorporating biochar into soil allows farmers to cut their compost and water resources significantly beginning once the biochar is introduced. The future of compost is with biochar; it makes sense economically, and environmentally. This partnership with Boston’s City Soil and NextChar is the beginning of an exciting trend for farmers, gardeners, and landscapers. NextChar’s mission is to build a healthy environment by sequestering greenhouses gases, absorbing toxins from the water and soil, and conserving water and fertilizer use in agriculture. For more information, please visit our website: www.NextChar.com or contact us directly.